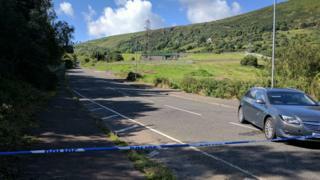 Police searching an area of wasteland in west Belfast following a report that remains may have been there, have found nothing. Police received the report from a member of the public on Wednesday. The person said that a bag containing possible remains had been seen off the Ballygomartin Road over the weekend. The road was closed between its junction with the Whiterock Road and Springmartin Road, but is now open. Det Insp Paul Rowland said: "The search has now concluded and nothing has been found. "While nothing untoward has been found on this occasion, I would like to encourage members of the public to continue reporting anything they feel is suspicious to police."